Call for information of class dates! Click on Logo to find some fun kid's websites! You have reached the Welcome Page for ACP Wildlife Control Services. ACP Wildlife Control Services is a full service wildlife control company family owned and operated. who offers wildlife removal and wildlife control. Offering either a one year warranty or a two year warranty on the re-entry of animals. We provide services to the residential, commercial and municipal industries. Our services include trapping, removal and or exclusion of animals in accordance to the laws set forth by the New Jersey Fish and Wildlife Department. We also animal proof the entry points made by the animal(s) with a warranty on our animal proofing. We also provide large scale control and management to properties. ACP is a total professional control company! ACP Wildlife Control Services offers service in Gloucester County, Camden County and Burlington County. Bat Control - ACP Wildlife Control Services will perform the removal of bats from the living space of a home or building. ACP Wildlife Control Services will also do bat exclusion and seal up the structure for the re-entry of bats, offering a five year warranty on our bat removal service. Beaver Control – ACP Wildlife Control Services will remove beaver from property with the proper permits and install a beaver flow device if needed. ACP Wildlife Control Services is experienced in trapping beavers we can solve your beaver problems. Coyote Control – ACP Wildlife Control Services has trapped coyotes and removed coyotes from both private and on public properties who are having coyote problems. Trapping coyotes and calling coyotes is part of our program. Flying Squirrel Control - This animal of the evening is a social animal. ACP Wildlife Control Services knows how to remove flying squirrel performing exclusion of flying squirrels. The same methods are used for the removal of flying squirrels and the removal bats. When ACP Wildlife Control Services is finished the control of flying squirrels we seal the structure and give a two year warranty on animal proofing. Fox Control – ACP Wildlife Control Services will trap fox and remove the fox from property. The fox may be denning up or near structure. The removal of fox is needed if the fox are feeding on small livestock and or small pets. Groundhog Control - ACP Wildlife Control Service knows how to remove groundhogs from properties where the removal of groundhogs is needed. Groundhog removal is needed when groundhogs under sheds and decks are causing foundations of homes, garages and central air conditioning units to collapse. The trapping of groundhogs is needed to stop rising costs to property owners. Mole Control - ACP Wildlife Control Services will remove mole(s) from yard. ACP Wildlife Control Services has great success trapping the mole. A good rule of thumb is there could be 1-2 moles per acre of ground. Raccoon Control – ACP Wildlife Control Services knows how to control raccoons by trapping raccoons and removing the raccoons from the property according to NJ state law. Once ACP Wildlife Control Services has solved problem we will animal proof entry and give a one year warranty on animal proofing or if customer would prefer a two year warranty on the whole house for the re-entry of animals we can do that offer. Skunk Control – ACP Wildlife Control Services will do the removal of skunks from property. Skunks mainly live under decks, sheds and bushes. Skunk removal can consist of 1-7 skunks depending on the time of year. Squirrel Control - ACP Wildlife Control Services will remove squirrels the same as the removal of raccoons in accordance with NJ state laws. ACP Wildlife Control Services knows how to remove squirrels and we know how to control squirrels the professional way! Once we have completed the trapping of squirrel and or the exclusion of squirrels in the attic and or structure in animal proof the entry offering a one year warranty on entry point or a two year warranty on the whole house for the re-entry of animals. Burlington County - (856)235-1643 Burlington, Marlton, Medford, Mt Holly, Mt Laurel, Moorestown, North Hanover, Palmyra, Shamong, Southampton, Tabernacle, Taunton Lakes, and Westampton. The above areas are in older areas of squirrel problems the company must also know how to control squirrels, to solve problem not just trap squirrels or chase them out. 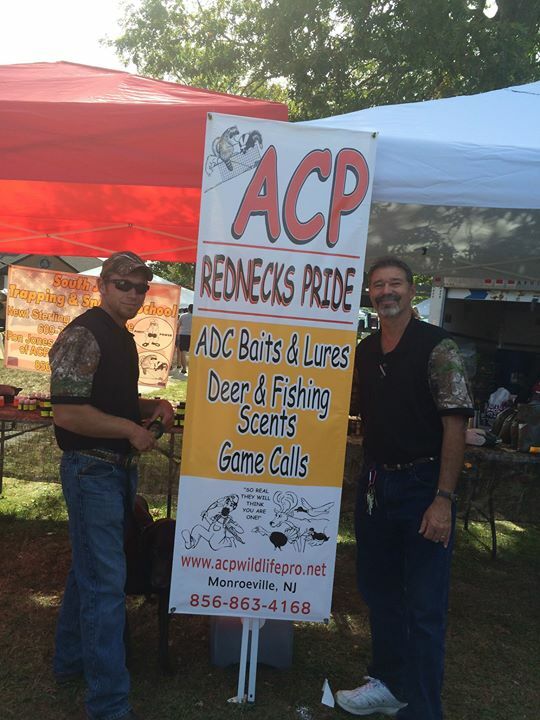 ACP Rednecks Pride is a here to meet your needs whether it is nuisance animal removal and repair or if you are a fellow hunter, trapper, fisherman looking for calls, baits and lure supplies. ACP Rednecks Pride is our own developed and manufactured line of baits and lures for both the ADC field, and the fellow hunter, trapper, and fisherman. We have also designed our own line of calls. Please click on anyone of the TABS above to find your need. Or please feel free to contact us with any questions you may have. "Out of the ground the Lord God formed every beast of the field and every bird of the air..."
Ron has had a love for animals, from a very young age. hunting, trapping and game calling lead him into the outdoor services. He started doing depredation work 32 years ago which lead him into urban wildlife control. He provides quality service to all his customers. Ron is known nationally as a speaker for his lectures on wildlife control and outdoor topics. He is referred to in the wildlife control field as "The Squirrel Man". He is a trapper training instructor, a member of New Jersey Wildlife Damage Control Association and NJ Fur Harvesters. Ron is the man to call for all your human wildlife conflicts, outdoor scents, adc/trapping baits/lures and game calls!